Brookies. Have you heard of them?! 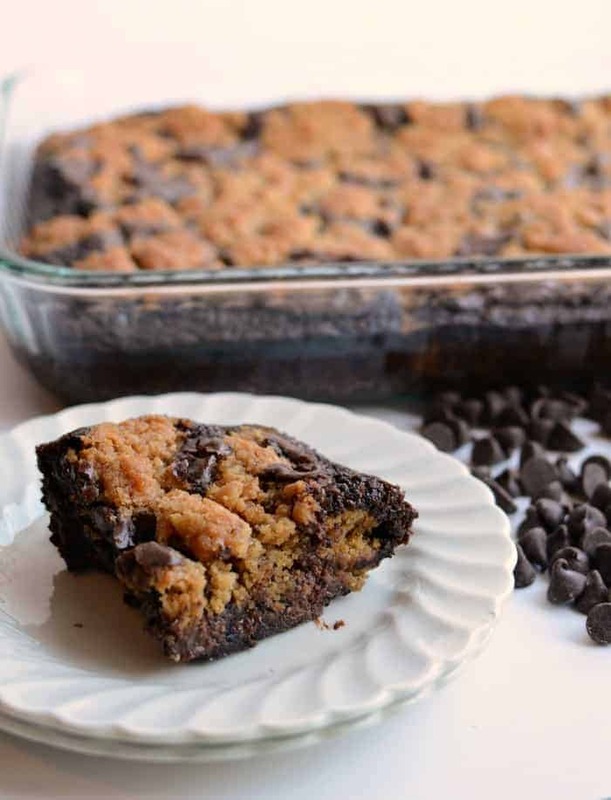 They are a delightful combination of brownies and chocolate chip cookies and they are amazing! 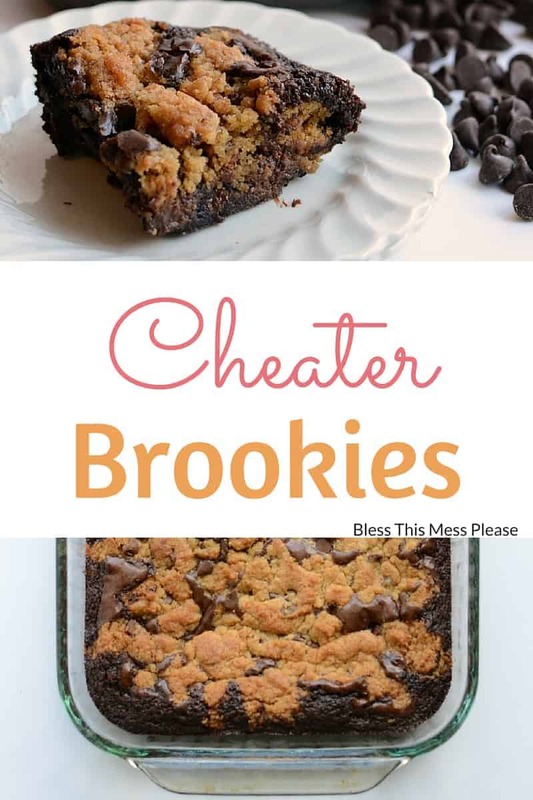 This recipes is a “cheater” recipe because there’s not really anything homemade to them. You know what though, that’s why I love them! They take me about 8 minutes to pop in the oven and I’m done. The taste is right on though. Trust me on this one, this is a must have recipe. This is the perfect treat to make when you need a snack to take to a church activity, a potluck, or other social gathering. They can be made the night before, they travel well, they don’t mind a little warm weather (no icing that’s going to melt in the summer heat), and everyone loves them. The only problem with them being so easy is that you feel a little silly when someone asks you for the recipe. Saying, “well, you just need a box of brownie mix and a bag of cookie mix and you are ready to roll” isn’t much of a secret family recipe is it? Oh well, most people can appreciate a delicious truly easy treat! I’ve made these no less than 10 times this summer and I’m pretty sure they’ll fall into fast rotation at your house too. Enjoy! 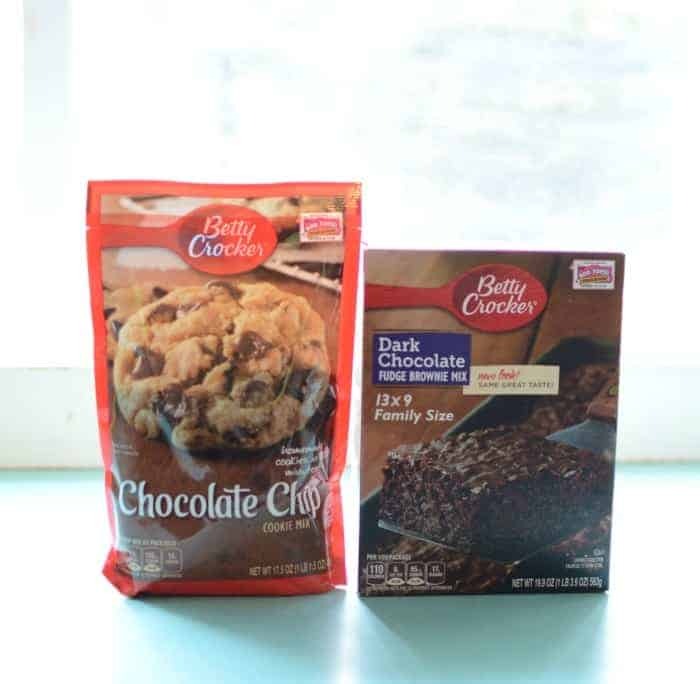 This is the brownie and cookie mix that I use. They are what I can get at my store and so that’s what I roll with. I’ll be honest, those cookies are not good as cookies in my opinion (because when you have the best chocolate chip cookie recipe ever, there’s no other cookie recipe in your life!). I don’t even like to eat the dough once it’s made. But when you add it to the brownies to make brookies, something magical happens and makes everything ok. Trust me on this one. I mix up the brownies and add them to my greased plan. I’ll use a spatula to really get the bowl pretty clean and then I’ll make the cookie dough right in the same bowl, no washing it out in the middle. It’s all making it into the same pan in the end… So not only is this easy, but you are only dirtying one bowl to make it. Here’s what it looks like before baking. Preheat the oven to 350 degrees. Spray a 9×13 inch baking dish with cooking spray and set aside. Make the brownies according to the package directions and add them to the pan. Make the cookies according to the package directions. 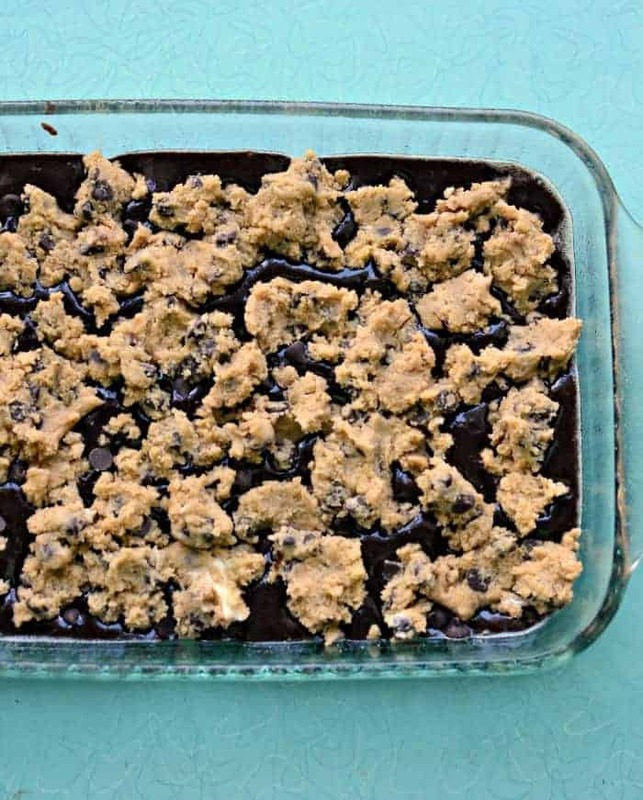 Add the cookie dough in chunky pieces to the top of the brownies (see pictures for example). Bake for 27-30 minutes until the cookies are nice and golden brown. If you can’t find the Betty Crocker mixes I use I recommend finding a cookie dough package that calls for butter as the fat to mix in. I tried one that called for oil and it wasn’t very good. I use a glass baking pan, baking time may very if you use a metal pan. Voila! And there you have one very delicious rich dessert that stays really soft and chewy. I know these brookies might go against my homemade philosophy but we all need a few tricks up our sleeve. Am I right?! Enjoy friends. If you need a few more dessert options, here’s my entire visual dessert category. My, it’s a pretty sight! I have been making these in muffin tins for a couple of years now because they are our granddaughter’s favorite of all the things I bake and I use the same mixes. This is so much easier though than dropping brownie batter into each tin, baking for just a few minutes, then dropping cookie dough onto each and baking again! That was the original recipe instructions. And, I don’t think she would mind the shortcut as long as she gets them. They are also called Browkies which is the name we use since she has a friend named Brooke whose mom calls her Brookie. Can’t wait to make this. Thanks! Making this tonight for our after movie dessert! I’m excited to try them with a heaping scoop of vanilla ice cream. Yum! Going to make these as cupcakes. Topping with a toasted marshmallow, section of a chocolate bar, and section of graham cracker for a cake auction. 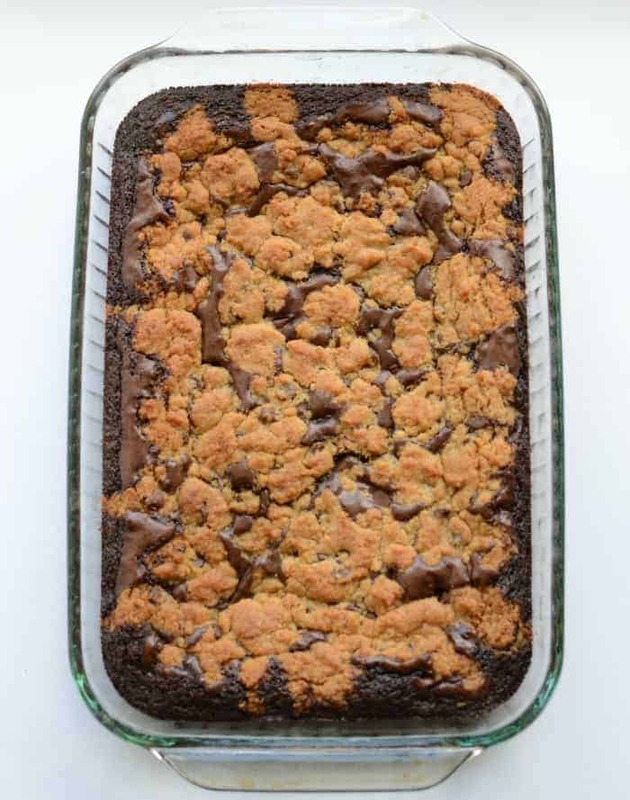 Pan is not yet out of the oven, but thank you for this easy version of a delicious dessert—using packaged brownie and cookie mixes makes baking easier for me, because the high altitude adjustments are on the package. Your suggestions and instructions made my Sunday morning plan to bake a yummy snack so easy! I can make brookies even more pathetically easy-purchase a refrigerated tube of your favorite cookie dough! Use two small tubes or one large tube. Pat them into the bottom of the baking pan, mix your brownies, pour brownies on top and bake according to brownie directions! Would you ever use a cookie sheet for this recipe? I had the idea of making a pizookie (pizza-cookie) type dessert, but HUGE, as in using a whole cookie sheet to just make a giant cookie. I want to see if I can add brownies, but I am not quite sure how to go about doing it without using a casserole dish, basically. I am have a group coming and I would like to be able to have all of us eating it directly from the pan with ice cream all over the top. Ideas? It puffs up quiet a bit while baking, I’m afraid it would leak out the sides of your cookie sheet. I think that you could serve it like that out of the 9×13 or if you had a really large cast iron skillet, like a 14 or 15 inch one, you could bake it in that and serve it out of the skillet. It would be super cute served out of a giant skillet! These were amazing. Making my second batch tonight for the game tomorrow. So easy and delicious. Hooray! And so easy too. Glad you liked them Aly!